Living on the west coast of Canada is pretty amazing because we really do get to experience all four seasons to the full. Summer-time involves lots of outdoor bike riding, patio cocktails and beach-time; as autumn rolls into winter, our sun-drenched skin is definitely ready to cover up in layers of over-sized chunky sweaters and boots. Along with the great seasonal change in fashion comes one of the highlights of living on the west coast, having a world-renowned snow resort literally a short 1.5 hour drive away. We're talking Whistler, British Columbia. The resort that is well-known for breeding the next generation of world-class winter athletes. Most times we will drive up the day of and come home after a long day of riding but this past weekend my husband and I decided that we would stay overnight in the village so that we could have apres cocktails, hop in the hotel pool to soothe our sore muscles and just have some quality down-time as a couple. Maybe because it was the first ride of the season or the fact that we were staying at an amazing hotel, whatever the case was, the weekend was fun, relaxing and romantic (a perfect couple's weekend getaway). Not surprisingly, I was equally as excited to plan my wardrobe for the couple days we were up there and the following are a few items that were put to good use and which I would never leave the house with the next time I head up to Whistler. My riding gear consists of the basics, however when I purchase items for snowboarding I bite the bullet and purchase quality well-known brands because after riding for over 20 years, I realize that the reason why certain brands are virtually synonymous with one particular sport is because the brand has invested the funds to test and produce the best products in the business, plus, once you purchase the item you're good to go for the next few years without having to update. 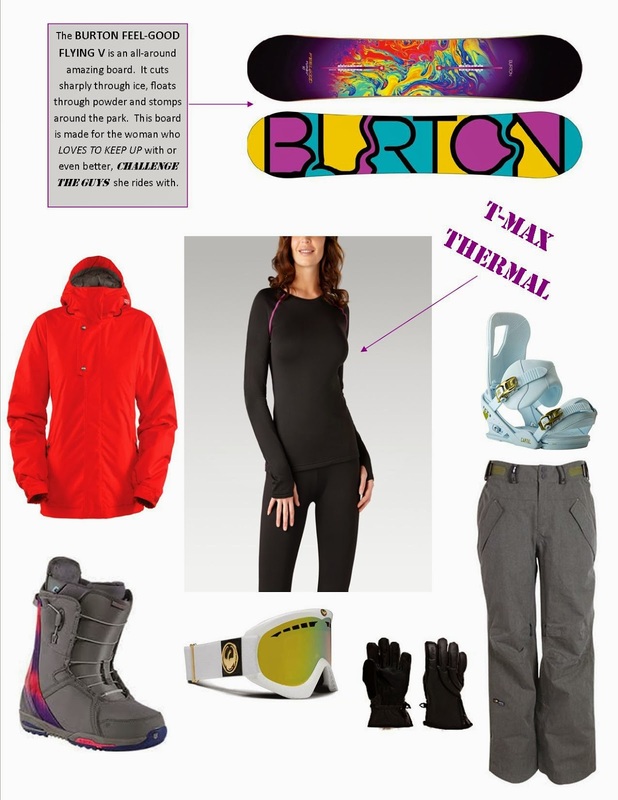 My favorite brands are Burton (hard-gear), Bonfire (soft-gear) and Dragon (accessories) and recently discovered the T-Max Thermal Gear as an underlayer; conditions on the mountain last weekend dropped to below -15 degrees C' and I didn't feel cold once, amazing! Saturday evening, we went for dinner at a fantastic sushi joint (Sushi Village) and afterwards, walked back to the hotel in the snow so comfortable walking shoes were essential. 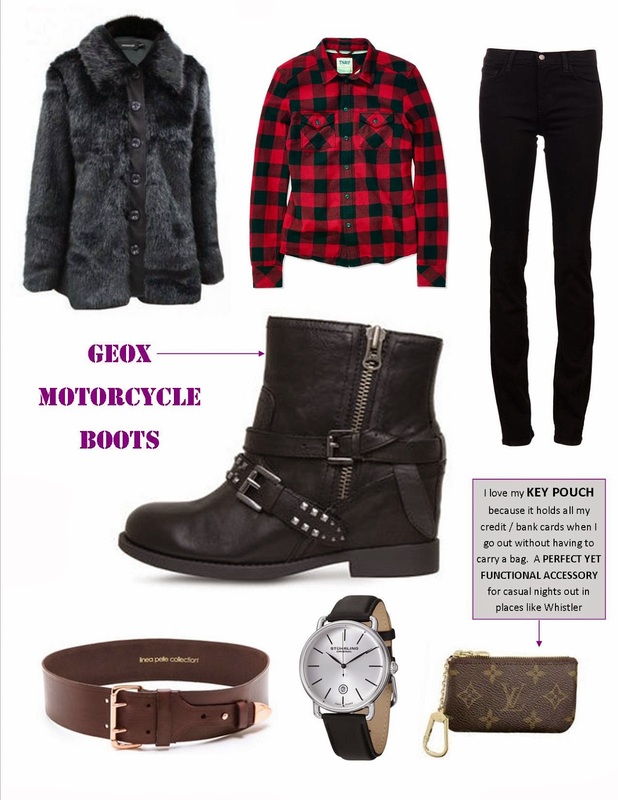 I discovered that Geox has completely updated their line of boots and am currently loving the motorcycle boots they have available. They are extremely comfortable, have great grip and most importantly, they look fantastic. These Geox Motorcycle Boot were the ones I purchased and have been wearing non-stop recently. Sunday involved lazing around, taking advantage of late check-out and then lunch at Dubh-Linn Gate. It was a bright, sunny Sunday so we sat on their patio and people-watched. The sun is always very deceiving, even though sitting on the patio was really nice, it was COLD. Thankfully, my faux-fur boucle jacket by Shelli Segal (Laundry), kept me cozy and warm. My jacket is another item that I have been wearing non-stop since the weather has gotten chilly. Whether to work or play, this jacket never lets me down and goes with absolutely every outfit I wear. Unfortunately my jacket is completely sold out but I did find a similar version from Minkpink, which you can find here. Being able to embrace the casual yet equally stylish fashion of the winter ski-resort last weekend was so much fun and I can't wait to repeat it soon.